At Crosby Park Garage based in the heart of Crosby, Liverpool, we're proud to be a representative of Nissan, providing you with a complete range of sales and aftersales services from this leading international marque. 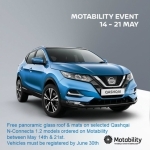 Explore the complete range of new Nissan vehicles for sale and used Nissan cars and vans for sale in Crosby, Formby, Bootle, Liverpool and Southport online or in person at Crosby Park Nissan, Liverpool. We're proud to be able to offer all of the manufacturer's latest model releases and special offers and you'll find them all here and on our forecourt on Coronation Road in Crosby, Liverpool. Whether you're searching for a new or used family hatchback, a sporty crossover or perhaps a sleek sports coupé, the team at Crosby Park Nissan will be able to find a vehicle that fits your budget and lifestyle. We offer full Nissan finance facilities to help you find the best way to drive a new or approved used Nissan, we are also your local Nissan Motability specialist for Merseyside. With over 50 used cars for sale, the selection of models on offer at Crosby Park Garage is comprehensive and delivers something for everyone, whether you're looking for a Nissan CARED4 used car or a used car from another marque. You can also rest assured that excellent aftercare is provided no matter what, with the You + Nissan CARE package including free roadside assistance, and a parts and servicing price match. In addition, Nissan recommends its dealer network and their certified Nissan technicians to use Nissan Genuine replacement parts to maintain & repair your Nissan vehicle. The experience and friendly customer service we offer at our dealership in Liverpool guarantees you will not leave disappointed. If you're considering a purchase or need support for your current vehicle, simply take a look around our website to see how we can help you. Alternatively, give us a call, complete an enquiry form or visit us in person at our dealership. We'll be happy to answer any questions you may have. Our friendly and inviting showroom is a fine setting in which to become acquainted with us. We ensure that each member of the Crosby Park sales team delivers the best levels of service and care, possessing the knowledge and experience to answer any questions you may have. They will, for example, be able to guide you around our dealership, identifying all the attributes of the used cars we have available. Why not contact a member of the showroom team here on the website or by phone and arrange to test drive one of our cars? Get behind the wheel of the new Nissan X-Trail and discover whether this adventure-seeking crossover is the right match for you. Looking for an efficient city car? The new Nissan LEAF offers 100% electric running, allowing you to cut the cost of motoring and support the environment. Wonderful experience from the moment I pulled into the dealership until the moment I left driving my new Nissan! Friendly and informative sales staff. Would certainly buy from them without hesitation. After speaking to a friend about my experience it seems he went along and was also very happy at Crosby Nissan, and ordered his brand new Qashqai. Service Manager was very nice and went out of his way to help me with my issues! Great results and I'm very grateful for his attitude and graciousness to me and my Mother.